Home > Alternative Medicines > Can OnDoc Set Healthcare on a Different Course? I am no fan of the current healthcare system. It has become a major problem, not only to our physical and environmental health, but to our financial health as well. If you didn’t know better, a case could be made that the intention of the healthcare system is to make people dumb (cognitively impaired), sick, if not kill them, as long as the associated expenses for services are covered. The caveat is that the “practitioner” ~ protected from the consequences of the damage that he or she has done ~ uses only “approved” methods, and the methods themselves create little real benefit, and many adverse effects. This may sound cynical, but the sobering fact is that it’s true. We have generations of doctors who have been taught no other way, who are oblivious to the natural, holistic, electro-chemical and biophysical system that each human body is. So it’s no wonder that disease instances come sooner, and debilitate longer, and that remedies ~ born of the same “War on Disease” mentality that fuels all other wars ~ are few and far between, progressively, and predictably more expensive. There’s no question that healthcare expenses have long been out of control for a large portion of the population, with one exception being representatives of Congress. 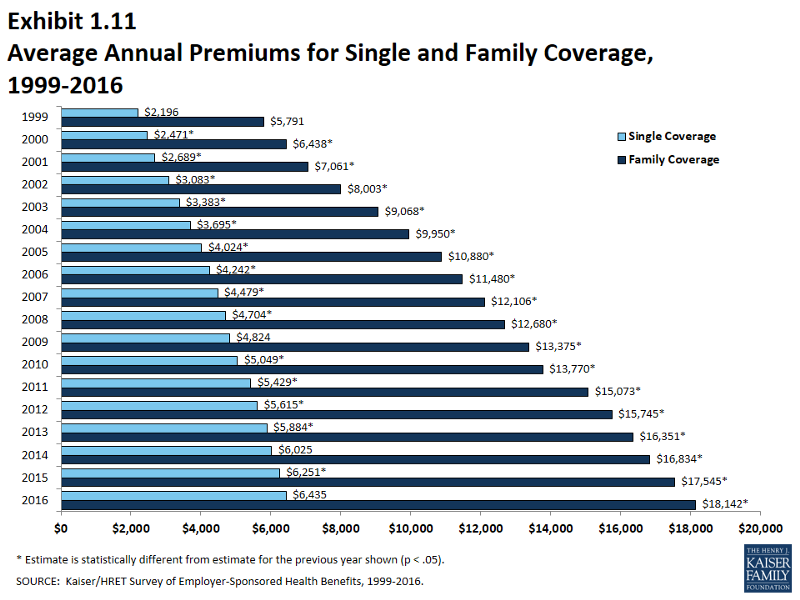 The graph below, from fair.org, shows how average annual health insurance premiums rose in the period between 1999–2016. Needless to say, rates are higher today, and will continue in that direction. That’s not the worst of it. Consider what the public is getting for this escalating expense. This data is from an article written by Gary Null, Ph.D. published at Awaken-Consciousness.com, and is a condensation of a more comprehensive analysis which can be downloaded here. The statistics shown in the graphic above only address a fraction of the health matters that affect a population of 327 million people each year. Despite passage of the Affordable Care Act which was signed into law by Barack Obama in 2010, a significant portion of the population still elects to decline treatment. As such, real healthcare costs are higher than reported, and useful, timely, patient-oriented, and affordable services remain rare. Enter OnDoc: Abating a Present-Day Disaster? If only the list of injured and dead from healthcare were as small as these two. I recently learned of a startup that could play a role in changing the course of healthcare, which seems fated to join the Lusitania and Titanic as trivia answers to “big things that sunk”. Located about an hour’s drive northwest of Philadelphia, OnDoc is positioning itself as an alternate resource for those 10’s of thousands of situations where an individual or family member arrange doctor visits, urgent care, or emergency room. It suggests that almost 75% of these interactions could be handled effectively over the phone, or through video via services called Doctors Online and Teledoc (operational 24/7). All physicians are U.S. based, board certified internists, and state licensed pediatricians and family practitioners. While it appears that OnDoc’s scope of services is still in the process of formulating, its intent is clear. Offer subscribers savings in time and aggravation, availability to subscriber-focused medical knowledge, with the ability to write/administer prescriptions at favorable prices… all for a $25 monthly subscription. There are no additional costs for membership. OnDoc adds one more wrinkle to facilitate rapid growth and a very meaningful benefit to each partner. That is through a Program that awards each Partner with a schedule of referral fees. For each friend or family member you refer to OnDoc who becomes a subscriber, you receive $6. If they refer someone, who also subscribes, you’ll receive $2 from that (they’ll receive $6). The benefits continue several generations down, adding either $1 or $2 more, depending on the level, for a total of five. As long as members pay their subscription, the referrer receives a fee, which is tracked in the back office. The fee is paid automatically to an account (presumably PayPal) associated with an email address that the Partner designates. The referral fee system is just that, a referral fee system that is part of the OnDoc business model. No one will join OnDoc to “make money”. It is not a network marketing company, pushing a product of dubious or unknown value. In this day and age, access to medical knowledge that is objective, not dependent on a conventional (i.e., price prohibitive) billing incentive, is valuable, because it is rare. Why availability to patient-centered medical knowledge is rare is not germane to this article. However, the current state of the healthcare industry, and its trending indicators, suggests that something different is long overdue. More updates will follow. I have an interview scheduled with a doctor that is associated with OnDoc. If you find this of interest, please use my referral link.